6.67 points at 12 votes (rank 452). In Complex the player needs to cross different labyrinths within a limited time. In each level there are new tasks to solve. E.g. 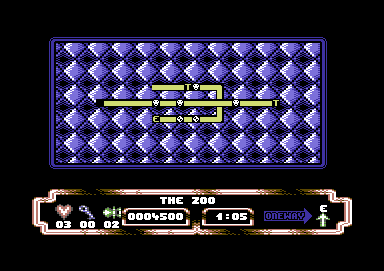 in the 1st level he has to find a key to open a locked door and on the way pass a walrus which blocks the way. But as the player is equipped with a plasma weapon, this problem is solved quickly. 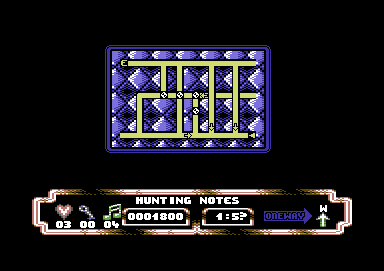 In the 2nd level you need to chase notes which move freely in the cave system. One way streets hamper the player. Level 3 is similar to a zoo. In later levels you need to activate teleports. If you have collected all items in the game or respectively solved all tasks you need to find the exit. This is a bit simpler if you take the overview map as a help. The game is designed in very soft animated "dungeon" pseudo-3D grphics, even changes of direction are made fluently. 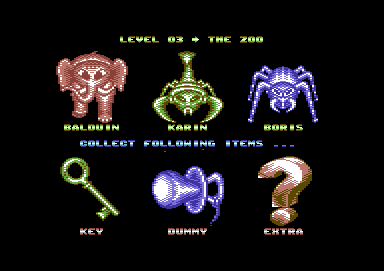 The monsters and items are made of two-coloured sprites which are augmented in fine stages when nearing the player. 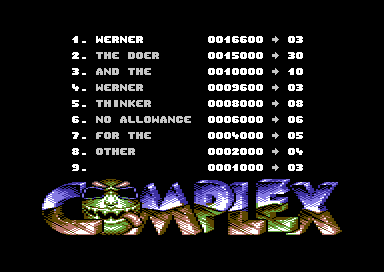 The whole thing makes an extraordinary good 3D-effect for a C64 and is occupied by sound effects. In the menu you have the possibility to enter a four-digit code. 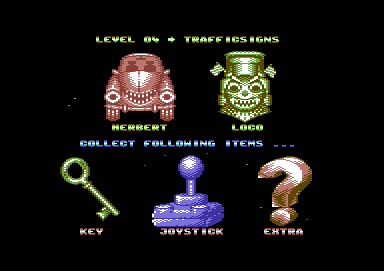 This is done by joystick in port 2. 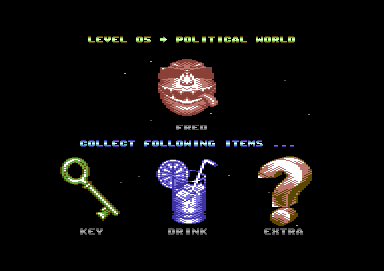 If you do not enter any code, you start in the first of altogether 30 levels. 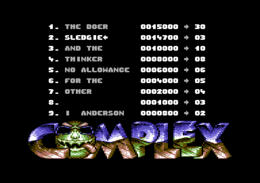 On this screen you are told what you need to find in this level, the name of the level and which code it has. 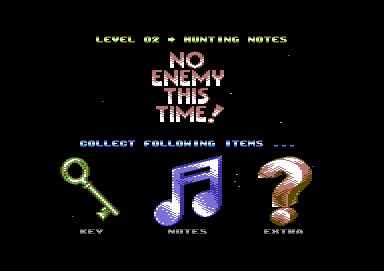 Furthermore there is a short information about all enemies in the level. You steer with joystick in port 2 and shoot with the fire button. When pressing the Space -key the whole labyrinth with monsters and treasures is shown. This costs a few seconds of time. 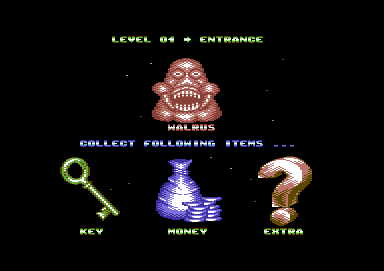 Level 1 - Task: Search the key and defeat the walrus. Level 2 - Task: Catch four notes. Sledgie: "Complex has its special attraction (I kind of want to make all levels at least once). 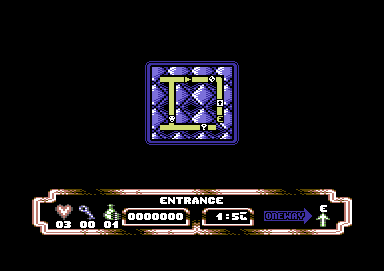 Although the labyrinths have a simple buildup, the player must not lose orientation, as this costs valuable time. The game is a mixture of arcade-shooter and a 3D maze. A bit annoying are the relatively long loading times. The four-digit codes are positive, as the get you fast into the higher level again." The game was released on the Game On 1/95, which was published in combination with the Magic Disk in the Play Time. Therefore, no official cover is available.